There are 3 modes of transportation available from Lisbon Airport (LIS), officially called Humberto Delgado, to the city centre of Lisbon: Taxi, Metro and Bus. The most convenient method to get to the city centre is by hiring a Lisbon airport taxi. The taxi ride will cost 20€ and it will take approximately 20 minutes to reach your destination. An alternative cheap option is the bus. Tickets for the bus cost 4€ and the trip to the city centre of Lisbon takes around 45 minutes. The less expensive, but indirect option is the metro. Metro tickets cost only 1.45€ and the journey lasts 35 minutes. Welcome Pickups offers meet and greet services and a friendly introduction to Lisbon at the same price as a regular taxi. Click here to see the cost. The most convenient way to reach Lisbon downtown area is by taking a taxi. It is important to note that Lisbon airport taxis do not look identical. Most of the taxis are cream-colored, but there are still a few old which are painted black and mint green. Since the airport of Lisbon is very busy you may have to wait in line in order to get a taxi. Without traffic, the ride to the city centre takes approximately 20 minutes. There is no flat fee for the transfer from Lisbon airport to the city of Lisbon. Therefore, your taxi ride will be calculated by a taximeter, depending on distance. Extra costs for additional luggage and late-night driving may apply. However, the estimated cost of the journey amounts to 15€. The waiting time for an available taxi can be very long since the airport of Lisbon is usually very busy. However, you can always use the escalators to get to the departure floor where there are always available cabs. Taxis in Lisbon can fit up to 4 people with 3 pieces of luggage. Lisbon taxis charge 0.80€ for each piece of luggage. Most of the Lisbon taxi drivers know at least basic English. 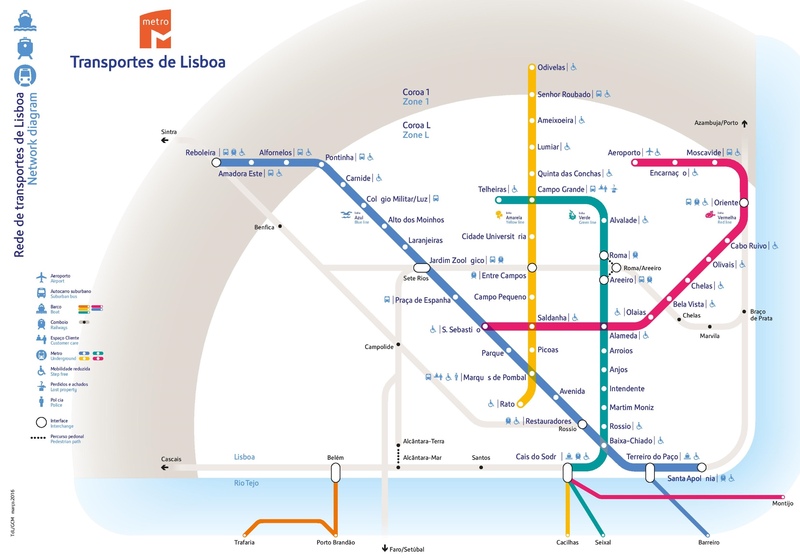 The metro network of Lisbon is directly connected with the airport. However, in order to get the city centre you have to switch metro lines during your transfer. First, you will use the red metro line from the airport and then you will have to change to the green metro line at Alameda or to the blue metro line at São Sebastião and, finally, get off at Baixa-Chiado. The metro trains run at 6-9 minute intervals and the journey towards central Lisbon takes approximately 35 minutes. How much is the metro from Lisbon airport to city centre? The metro service of Lisbon is considered to be very fast and reliable. However, when travelling from the airport to the city centre of Lisbon you will have to switch lines and that can be very challenging and inconvenient. Please be aware that the metro ticket machines of the airport are not enough and there is only one ticket counter. Therefore, during rush hour you may have to wait in line to buy a ticket for more than 15 minutes. Getting off at São Sebastião or Saldanha is a good option if you want to visit the financial centre of Lisbon. You have to swipe your metro ticket card both when entering and getting out of the metro station. Always keep an eye on your belongings and be aware of pickpockets. 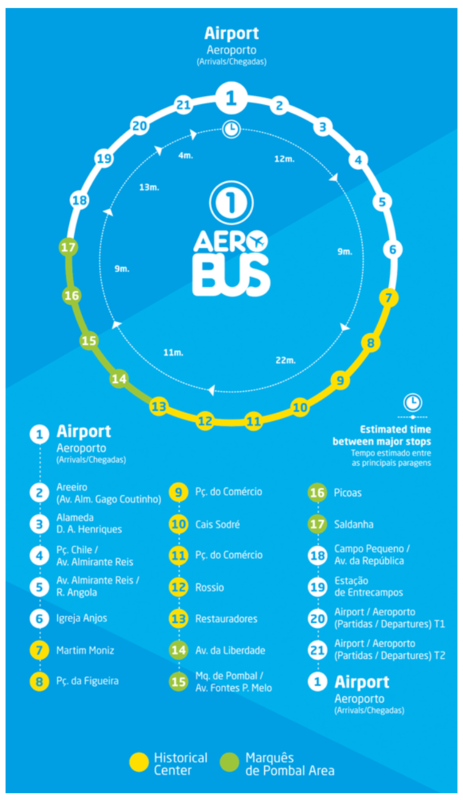 The Aerobus Line 1 is a special bus service by Carris/Yellowtours which operates the route from the airport to the city centre of Lisbon. In order to get to the heart of the city centre just get off at any stop between Restauradores and Pc. Comercio. Those buses depart from the airport every 20 minutes and the average travel time is 45 minutes. The Aerobus Line 2 travels towards the financial centre of Lisbon. *There is also the cheaper regular citybus line 783 which follows the same route as the Aerobus Line 1, but it takes longer and you cannot use it if you have more than one piece of hand luggage. How much is the bus from Lisbon airport to city centre? The Aerobuses are known for providing very reliable and comfortable services. In addition, those luxurious vehicles are equipped with large luggage racks, USB charging sockets, screens displaying the next stops, and free Wi-Fi. There is also the night bus line 208 that travels to Cais do Sodré and Oriente stations from 11:30 p.m to 04:30 a.m.
Buying your tickets online can ensure cheaper prices. 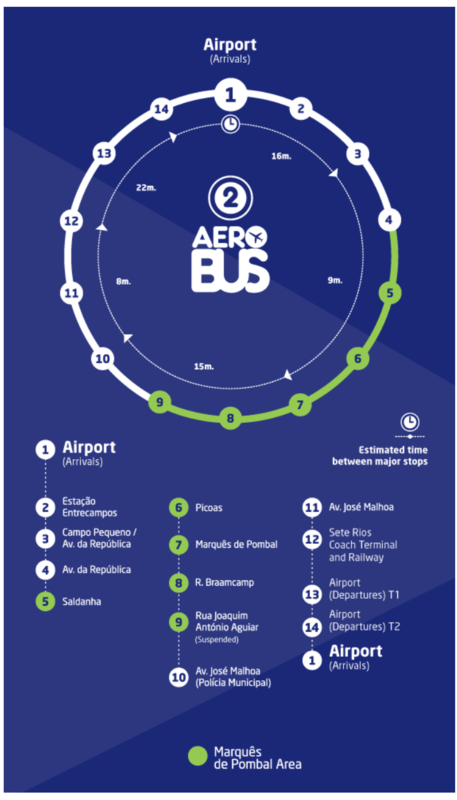 The Aerobus Lines stop near some of the major hotels and hubs of the city. The Aerobuses are accessible to passengers with reduced mobility. How much is a taxi from Lisbon airport to City Centre? The average price of a taxi trip from Lisbon airport to the downtown area of Lisbon is 20€. Without traffic, the ride takes around 20 minutes. How much is a bus ticket from Lisbon airport to City Centre? Aerobus single tickets cost 4€ and you can buy them from the airport's ticket counters, straight from the driver or online. How far is it from Lisbon airport to City Centre? Lisbon city centre is approximately 6 km from Lisbon airport and you can get there either by taxi, metro or bus.